I don’t normally post on Sundays but I came across a deal this weekend that expires today, so I’m sharing it in a quick post just in case it’s helpful in your upcoming holiday decorating. Update added 11-2-15: It looks like they still have the 10% off deal going on, which is great! Tip: If it shows the wreath is out of stock for your store, click in the box that looks like this one below and you’ll be able to check other nearby stores for stock. 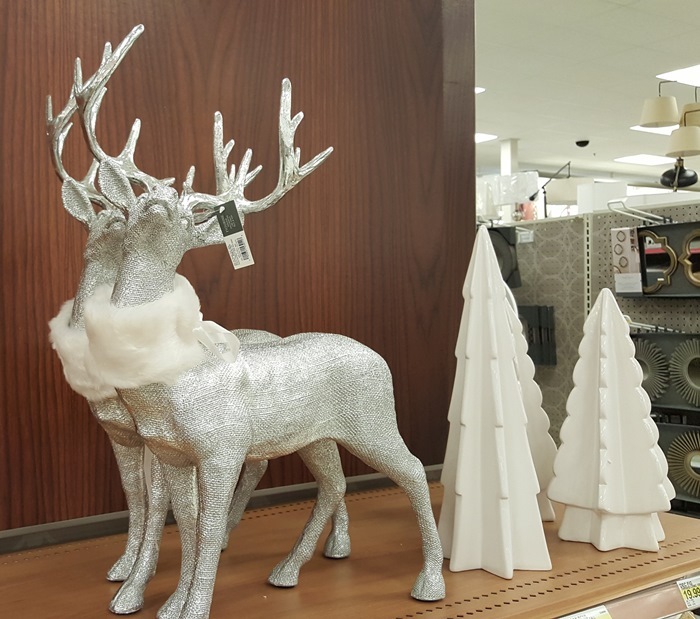 Yesterday, I stopped by Target and purchased a few home-related things for the upcoming holidays. One of the items I picked up was a large preserved boxwood wreath. I’ve always been a huge fan of those because they’re real, are beautiful and last for several years. When I saw the big 21″ wreaths were selling for just $44.99, I knew that was an awesome deal because I’ve been shopping for a large boxwood wreath for several years. Usually they are way more than I’m willing to spend. For example, right now a wreath measuring just 18 inches (3 inches smaller) is going for $79 at West Elm. One Kings Lane wants $145 for a 24″ wreath and even at my favorite place to shop, Amazon, the best price I can find for a large 22″ wreath is $62.95. See what I mean…awesome price! 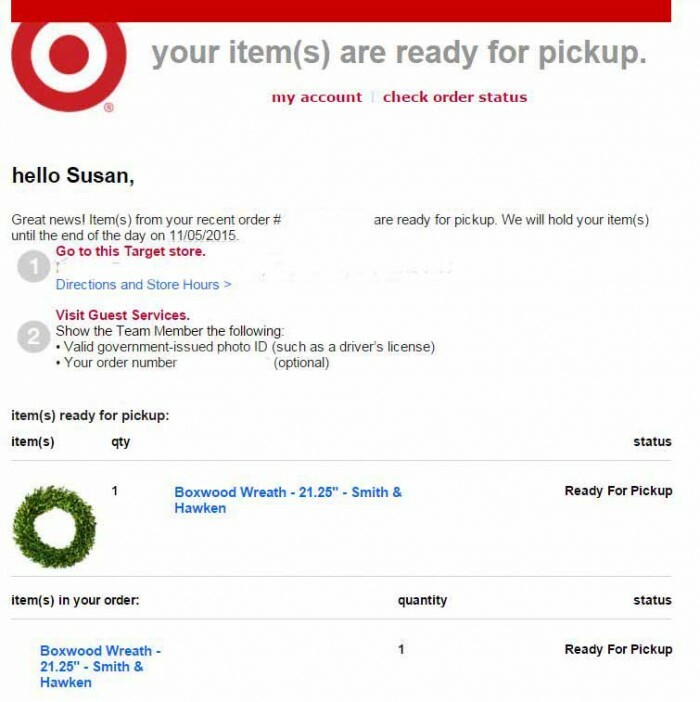 This morning I went online at Target to see if they had any other sizes available and discovered if you order the wreaths online to pick up at your local store (I don’t think they don’t ship them) you get 15% off if you spend at least $100. But even if you don’t spend that much, today they are taking of an extra 10% off with the code, EXTRA10, no matter how much you spend. So, that means, in addition to the already great price these wreaths are going for, you could potentially get 15% off, plus another 10% off that! No matter what, you’ll at least get 10% off with the EXTRA10 promo code! 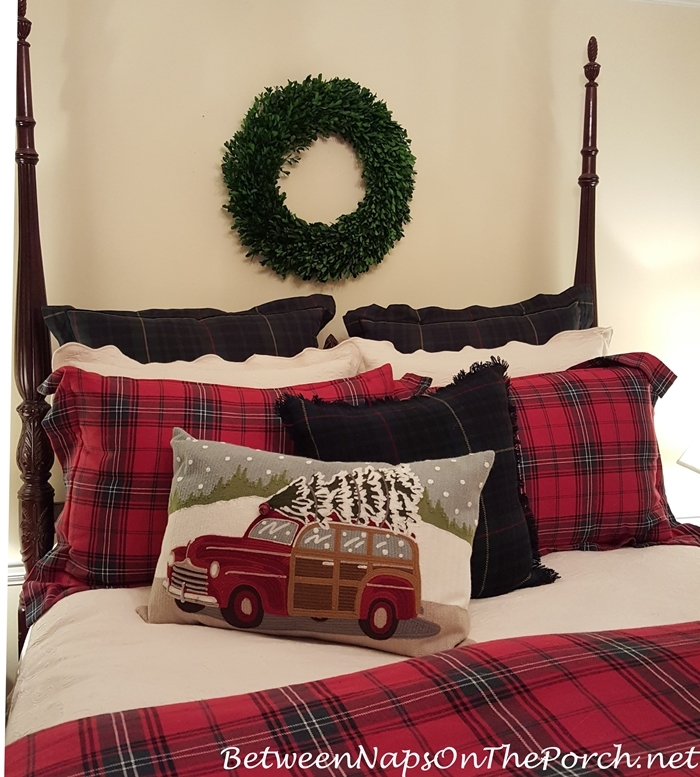 The larger wreath ended up over my bed. I love it there! I like this wreath here so much, I’m tempted to leave it up even after Christmas is over, at least until spring when I’ll change out my winter bedding for spring bedding. 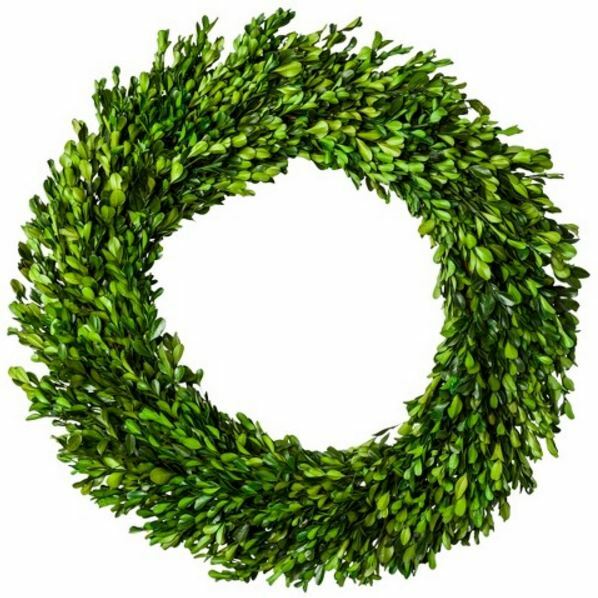 This is such a great deal on the big boxwood wreaths, I just ordered another large one for my kitchen. It ended up being around $42 (including tax) with the EXTRA10 promo code. I’m going to pick it up this morning. I’ve always wanted to hang one in the center of my kitchen bay window at Christmas. At this price, I’m going for it this year! If you want to jump on this sale before they are all gone, you can order your wreath online here: Boxwood Wreath. If it tells you they are sold out, don’t believe it, just click on the box that says “Find In Another Store” and check for it in the stores near you. I don’t think they’ll be in the stores for very long because my Target store only had four. I purchased one last night and another this morning so that leaves just two left at that location, unless they get more in later. Make sure if you order a wreath online (to get the 15% and 10% discount) that they are showing the correct store in your area for where you’ll go to pick it up. When I placed my order, I changed the store location they had showing for me to the one that’s closest to my house. Okay, I’m off to take down my Halloween decor from the front door. Did you have a great Halloween? I had around 65 Trick-or-Treaters last night so it was a fun, fun night! Update: I just drove over to pick up my wreath and while there I took a peek at some of the other Christmas goodies that are being put out. I noticed these deer way up high on a shelf. One of the other items I passed up on initially but did go back for was this cute pillow for my upstairs family room. It made me lol when I saw it. If you follow BNOTP on Instagram, you saw it yesterday. It’s available here: Christmas Pillow with Deer I placed it on the long window seat in my upstairs family room. I love this time of year! 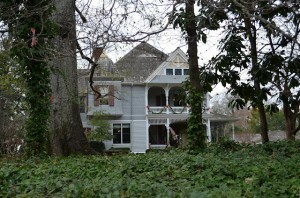 I can’t wait to put the wreaths up on the windows…won’t be long now! time…….thank you for the Sunday post. I’ve been a follower of yours for about 4 months now and so enjoy seeing your post on my computer. Your mirror in your entry is so beautiful. I’d like to hear a little about its history. We have family in Atlanta, I’m thinking you live in that area as well; not sure but I’ve been wondering. Living here in the gorgeous Northwest is such a blessing, our autumn is beautiful beyond words. I’d love to have you stop by for afternoon tea should you ever be in our area (Redmond WA) I think you might just enjoy a peek at our home as well. Oh, I need to change my clocks, totally forgot about that! Thanks for the reminder. I found that mirror about 20 years ago in a store that was in business for many years here in the Atlanta area. Unfortunately they closed up about 10+ years ago. It was called Furniture Craftsman. Most of what they sold was out of my budget but I managed to catch a few things there on sale over the years, including the mirror. Thanks so much for that invite, Carolyn…that would be delightful! Thanks so much for this tip, but I a too late. Just tried to order the large wreath and they are not available. Got several smaller ones for my kitchen French doors. Jean, that was picking it up at the store, right? Do you have another store near you? You may want to try another Target if you have another near by. I noticed my store is showing low stock now, which makes sense since they only had three and I purchased two. But there are several other Targets near me, so try another Target near you if you have one close by. Thank you, never thought about that. Will try Douglasville and Newnan. Thanks so much. Jean, when you go to the website, there’s a box that say “check other stores” or something like that. Click that box and it should bring up the other stores in your area and show you the available stock. I love how the Target website does that. I wish all stores did that…would be so convenient when you’re trying to find something. I know there are some still left in the Cobb Country area. Thanks so much for posting this, Susan! I’ve been wanting 2 smaller boxwood wreaths to hang on my armoire doors but couldn’t bring myself to pay the price! I’ve already ordered two of the 11″ ones this morning. Debating on the larger one. As always, we love your tips and this is a great one! Thanks for letting us know. I, too, love boxwood wreaths but don’t love the prices. I’ve ordered two and can’t wait for my email saying they are ready for pickup. By the way, I had to choose the store location on each of them: the website defaulted to one across town each time. Again, thank you! I know, it did the same thing to me. It defaulted to one that was like 8 miles away when I have two that are within 2-3 miles of my house. Glad you found some, Linda! 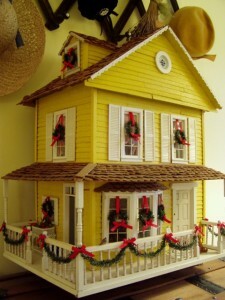 I just picked up the one for the bay window and love it there! I once saw them hanging on all the windows in a living room on a Christmas home tour and have never forgotten that image. They were beautiful! Thanks for the tip Susan! I have been looking at these wheaths and I just ordered 3. Loving your plaid bedding, too. I have been gathering red bedding for all the beds for this holiday/winter season. If anyone is interested Macy’s Chater Club has a beautiful red coverlet and sham set at a very reasonable price. Ohh, thanks for the tip Maureen! 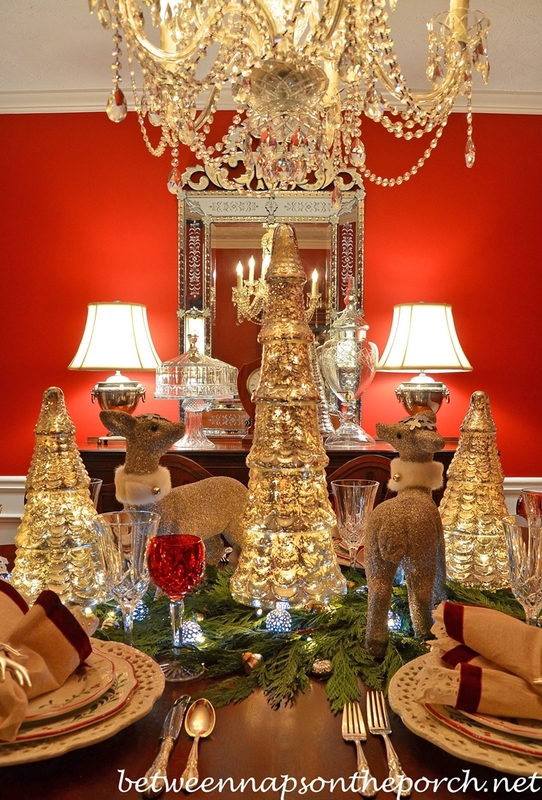 I was just drooling over all their Christmas china patterns last night. Will have to checking out the bedding. Target’s website will not even let you choose a store on the large wreath . 🙁 They must have been very popular! The small wreath at most of the Nashville area stores. Thanks for the tip! I saw that cute pillow and passed on it. I have the PB pillow so thought I shouldn’t get another. Now that you show it, I might need to add it. I guess I didn’t look closely. I missed who was driving the car. Ha! Too cute! Reason enough to add this one. I know, that was the reason I barely resisted the first time, figured I already had one woody pillow. But the deer got me! lol It looks good in the middle of the long window seat in the upstairs family room. Thanks so much for the tip about the boxwood wreaths! And your travel shoes post is much appreciated, also! Your ideas are great and your blog is always fun! Thanks so much, Kay…so glad that was helpful. I wore my Sperry plaid rain boots today when I picked up my wreath at Target…was glad I had them since it’s raining here AGAIN today. It wouldn’t let me choose shipping for the big one I ordered. I wonder if they only ship the little ones. I’m so glad you got one, Carol. The smaller ones are very versatile for hanging in so many places like on armoires, secretaries, wall sconces, etc… I even like them on glass-front kitchen cabinets. Just noticed Target’s sales ad in the Sunday paper. It says they are offering free shipping and returns on every Target.com order. Offer is valid through December 25, 2015 Free standard shipping to 48 states. Thanks for the tip, Susan. 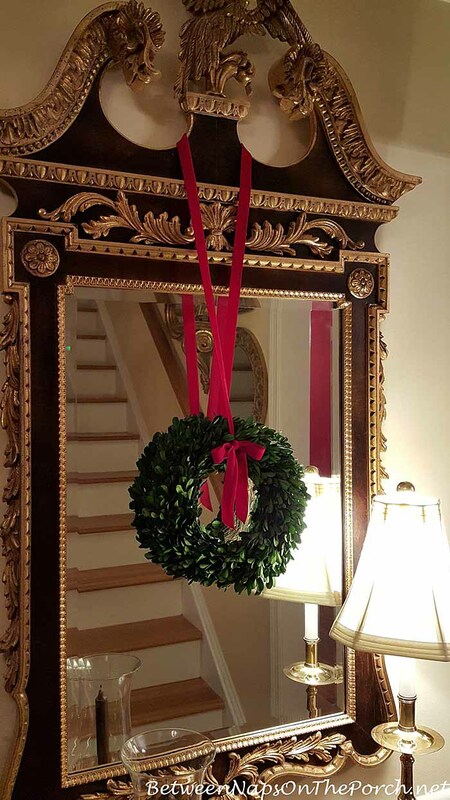 I had the same problem with the large wreath when I accessed the website from clicking on your highlight so I ordered the smaller ones for the front windows, but I decided to go back for something else and I was able to get the large wreath w/o a problem by accessing target.com and searching boxwood. Sandra, I wonder if when I got the link, it picked up on my location because when I visit it, it keeps trying to put me into another zone where there aren’t any wreaths available. When I click on the box to have it check other stores in my area, it does find them, then. So glad you were able to figure it out. I don’t think at that price they will be around very long. Your blog is always my favorite! Thanks for the Sunday post. Just grabbed two of the smaller wreaths online and plan to use them on my mirrors similar to your arrangement above. Have a wonderful week! 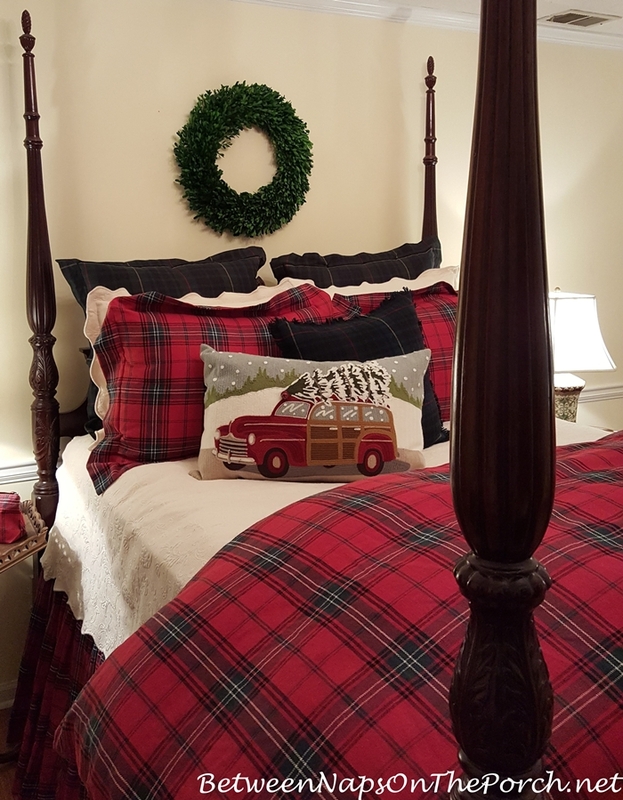 I absolutely love how the boxwood wreath, red plaid bedding, and the woody wagon pillow go together. 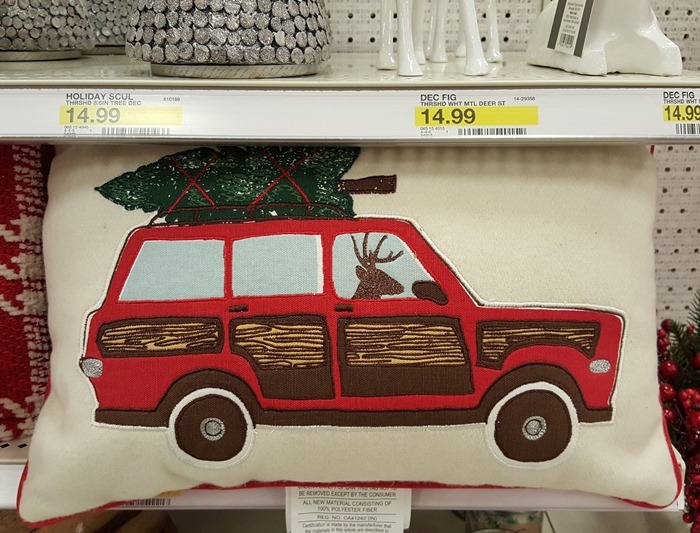 So classic, warm, and festive! Thank you Susan for your post! 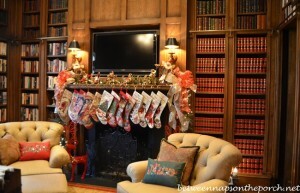 I just ordered my wreaths & the reindeer & will pick them up shortly!! thank you for the boxwood wreath tip. 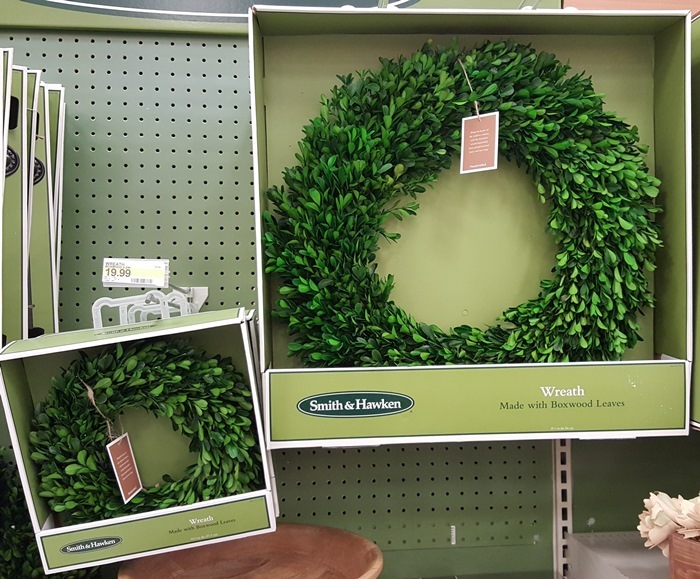 how would you rate the quality of these wreaths from target, compared to the boxwood wreaths that you hang from your glass front kitchen cabinet doors? i enjoyed sharing your trips to africa and to italy vicariously. thanks for sharing your adventures! They are great, very similar. The smallest Target wreath is 11 inches so it’s a fair amount bigger than the ones I use on my cabinets. I think the color is bit darker green, but other than that, they are very similar. They are on different bases. The 8 inch I use on my kitchen cabinets have greenery on both side. These have a natural wreath on the back side. I love deals such as these. Thanks for the heads up. Linda, another reader mentioned that it let her order them and have them shipped to her home, with free shipping. She was ordering the smaller wreaths, though. Not sure if they are shipping the bigger ones. Just wanted to mention that in case it will allow you to order them online instead of for pickup at a store. I’m on it- that’s even cheaper than our local florist, who I can get an 18-20″ for $36! 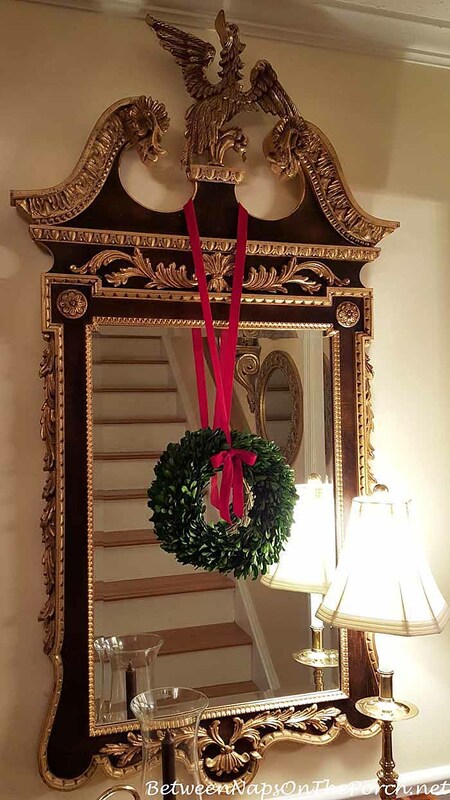 Susan, have you ever done a little tutorial on how to do the pretty bows for hanging the wreaths? You always do such nice and precise instructions on your tutorials, and when I do the bows, the “loops” always come out crooked! I think I read on one of your posts once that you tied bows for one of your neighbors – you must be good at it! Thanks! Elena, do you mean the bows for the wreaths I hang on the front of the house? Those I didn’t make, found those one year on sale in Michaels. I loved the long tails on them and the price was really good, so I purchased them rather than try to make them. Now when I see them for sale, I’m surprised at how expensive they are. I do make the bows I use on my Christmas presents and they are easy to make. The trick is just to twist the ribbon each time from the center after you make each loop, so the correct side of the ribbon is always facing up. With ribbon that’s the same on both sides, you don’t have to worry with the twist. I just searched for bow tutorials and there are quite a few online: https://www.google.com/#q=how+to+make+bow+for+a+present I may try to create a tutorial post for that sometime, though. Thanks for the suggestion! Susan, thank goodness you are not like me and laying on the sofa after church watching Say Yes to the Dress. Because of your post, I managed to pull myself off the couch and order the large wreath and three of the smaller ones for $87.27 with tax. I’ve needed new wreaths for years (my front door sugared fruit one looks more like dehydrated fruit it’s so old). Going to order a wooden monogram this week to hang with it (just saw in a holiday magazine and love the look). Thanks for getting my holiday ball rolling! Susan, love your blog!!!! Ordered 2 of the small wreaths, and they have already been shipped. Thank you! Enjoyed your post very much & I recently discovered the savings at Target by ordering online. The first time I did that & saved $10.00, I received an E-Mail 15 minutes later saying it was ready for pick-up. My next online order saved $25.00 & was ready just as quickly. I love that! Here’s the link to the monogrammed boxwood wreath I’m looking to copy. Susan, thanks again for the great tip! Ohh, love the monogram added atop of the wreath! The monogram would be fun to trace, then cut out with a jigsaw. I, too, am in the Atlanta area – Roswell – & was able to pick up the large at Northpoint yesterday & have a small to pick up today at my local Roswell Target. I too had to order the wreaths on Sunday! Couldn’t pass this up and love the boxwood wreath in the bedroom. Mine will be delivered tomorrow. So pretty! I love boxwood too. For the past few years I have put a fresh boxwood wreath on our front door at the holidays instead of an evergreen one. (We have a great supermarket in the Northeast called Market Basket that sells them with the other holiday greenery for a steal.) It’s so pretty with just a simple red velvet bow, and a gold metal letter ornament featuring our last initial (a Restoration Hardware find about 10 years ago that I leave up all year round – looks a bit like a doorknocker!) Come New Years, I replace the red ribbon with a snowflake ornament or silver bow. 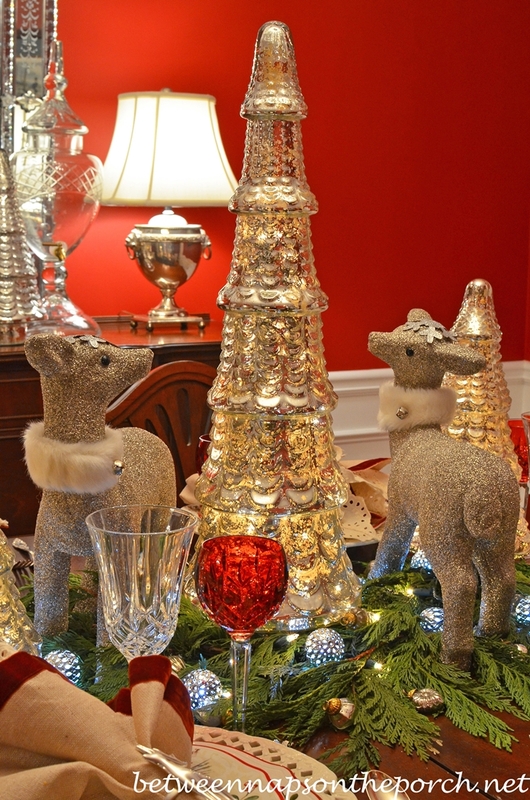 Your wreaths look great – and I adore that lovely candlestick lamp in the foyer too! Jill, I love that idea! I’m crazy about anything with a monogram and I love the idea of enjoying the wreath even longer. I always hate to toss live wreaths and keep them up as long as I can. 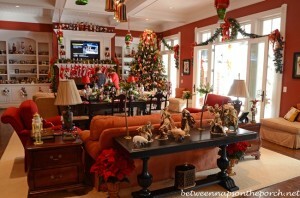 I love that you show us when you can where you find your amazing items for the holidays. This is not a big deal in the grand scheme of things but, I know how much of a plaid lover you are and I found on Williams Sonoma I’ll plaid Spatula. needless to say I’m buying them and they also had one with a drawing of a turkey, the pumpkin one unfortunately was sold out. Keep up the good work look forward to reading it everyday and I want to wish you a Happy Thanksgiving! I would have sent the link but I’m working off of a tablet and haven’t figured out how to do it yet. I couldn’t believe it when I saw it! Like I really need another spatula, but I figured, I might never see this again. I’m not sure if I will actually use it as it is so pretty. Yes I know you love plaid and I love plaid. In fact I have plaid pillows on my sofa along with a red cardinal and Mr Fox throw pillow. While I was in HomeGoods a while back I picked up some salad / dessert plates that were acorns. I know the leaves are easy to find in the pumpkins are easy to find but the acorns had never seen them so I bought them to go on my autumn plates. Love the deer that you showed as well I don’t often think to go into target but, tomorrow on my lunch hour guess where I’ll be going? I too would have bought the box wood wreaths but I am moving back to my hometown in upstate New York and trying not to buy too much of that now as I will only have to move it. Thanks again keep up the good work you are appreciated! I just discovered this post, and love the napkins on your table setting. Do you recall where you acquired them? Thanks! Both the eyelet napkin and the linen outer napkin with the velvet edging, are from Pier 1 a couple of years back. They continued to carry the eyelet napkins for a while, so they may still have those or may get them back in again this spring. I am so glad I came upon your post. I just ordered the large & small boxwood wreath & got the discount. How awesome is that.